Breccia pipes are vertical collapse structures, typically a few tens to hundreds of feet across and hundreds to thousands of feet in vertical extent. The pipes formed more than 200 million years ago within Paleozoic and Triassic rocks over a broad area of the Colorado Plateau around the Grand Canyon. The pipes formed as groundwater, flowing through the Redwall Limestone, dissolved material along fracture zones and created caves. Continued dissolution caused collapse of overlying rocks into the caves forming breccia pipes and sink holes. The Survey has identified “1300 pipes or suspected pipes” in the region. “Mineralized breccia pipes—pipe-like masses of broken rock—may contain high-grade uranium ore and variable amounts of copper, gold, silver, vanadium and other mineral ore. More than 71 mineralized breccia pipes have been discovered in the region, and as of 2010, nine of these pipes yielded more than 10,500 metric tons of uranium.” “It appears from this work that the number of suspected breccia pipes is one to two orders of magnitude greater than previously recognized. (The number may be even higher since many pipes do not yet have a surface expression.) The study raises the possibility that the higher concentration of breccia pipes is likely to extend across the entire region.” This means also that there is potential for much more uranium and other valuable minerals. 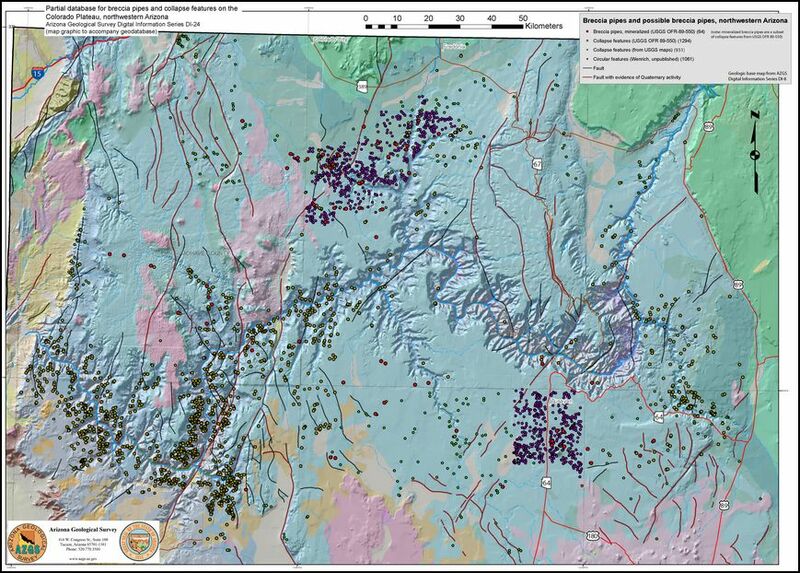 The Arizona Geological Survey has just completed and made available a new report “Partial database for breccia pipes and collapse features on the Colorado Plateau, northwestern Arizona” which you can download here. 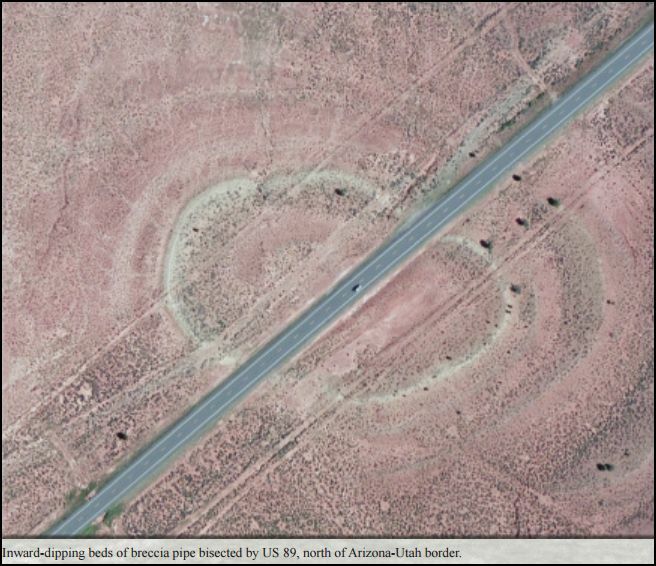 The cover of the report shows Highway 89 crossing a depression, the surface expression of a breccia pipe. The breccia pipes exist because of the nature of the Redwall Limestone, a 350-million-year old formation that forms high red cliffs near the bottom of the Grand Canyon. The limestone is actually grey, but has been stained by iron and manganese oxides derived from overlying formations. The Arizona Geological Survey has another publication on the history of the Redwall Limestone itself. You can download it here. That publication is non-technical, has many illustrations and is suitable for the layman or classroom. • Diverse and long history over the last 350 million years. • Magnificent cliffs and red walls. • Has thousands of miles of interconnected caverns spread out over the Colorado Plateau. • Has many caverns, some with ancient and modern speleothems. • Is the source of carbonate for the growth of abundant travertine deposits. the canyon and region, consumed by most visitors to the canyon. Although the area holds great potential for mineral resources which could be mined with minimal disturbance to the environment, radical greens and their Congressional fellow travelers are bent on banning mining in the area. On January 9, 2012, the Obama administration announced a 20-year ban on new mining claims on public land near Grand Canyon National Park, thereby denying access to valuable minerals resources. Now there is a proposal to establish “Grand Canyon Watershed National Monument” which would cover 1.7 million additional acres (see green areas on the map here). If established, then all mineral potential of the area would be off limits. See details of current and pending areas made off-limits to mineral production here. Posted in Geology and tagged breccia, Copper, Grand Canyon, uranium on July 5, 2015 by wryheat2. In 2014, Arizona produced $8.06 billion worth of minerals which represented over 10% of total U.S. production. Major non-fuel minerals were copper, molybdenum concentrates, sand and gravel, cement, and crushed stone. Arizona produces over two-thirds of U.S. domestically mined copper. The total impact of the mineral industry on the U.S. economy of was $17.4 trillion in 2014. That figure includes mining, processing, and value added by manufacturing. The USGS notes that the U.S. is at least 50% reliant on imports for consumption of 43 mineral products and is 100% reliant on imports for 19 of those minerals. However, the U.S. was a net exporter of 17 mineral products. 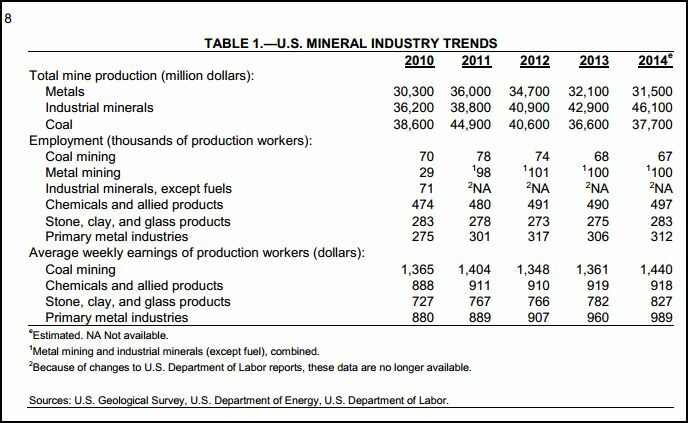 The table below shows mineral industry trends of production, employment, and wages. The Mineral Commodity Summary document provides detailed information on 83 mineral commodities. Posted in Geology and tagged Arizona, Copper, Minerals on February 11, 2015 by wryheat2. Copper is vital to our civilization. It is used in many things we may take for granted. Below is an infographic from the National Mining Association showing how copper is used and where it is mined in the United States (you can get the graphic here). You can also get a new report “U.S. Mines to Market” which shows the importance of mining to the manufacturing segment of our economy. In 2013, value added to gross domestic product (GDP) by major American industries that consume processed mineral materials was $2.4 trillion, or 14 percent of total GDP. As the U.S. manufacturing sector continues to grow, the importance of a secure, stable, reliable and sustainable raw material supply is increasing. The U.S. permitting process for new mineral and metal mines makes it difficult for our nation to reduce dependence on foreign-sourced raw materials. As it stands, the average waiting period for U.S. mine permitting is seven to ten years. Just to put that into perspective, in Canada and Australia—countries with similarly stringent environmental regulations—the waiting period is two years. This article is a guest post by David Briggs. The opinions expressed are his own. When listening to the statements put forth by leaders of groups opposing the Rosemont Copper project, think about what they are saying. Then ask yourself; does this really make any sense? Is this logical? What are their motives for making these statements? While many valid concerns have been raised by the public, these issues have been addressed during the permitting review process. Despite this, groups like the Save the Scenic Santa Ritas dispute these findings and continue making arguments that are based on emotion and not supported by the facts or the rule of law. Other statements contain partial truths designed to support their arguments, which upon closer examination reveal crucial information refuting their position has been conveniently omitted. Many of their arguments are not even applicable to the point that they are trying to make. Let’s examine one quote by Ms. Gayle Hartmann, which was made at a Save the Scenic Santa Ritas’ fundraiser held on June 5, 2013 in Green Valley. Ms. Hartmann’s statement is hardly an accurate characterization of Augusta Resource Corporation or junior mining companies. First of all, juniors, such as Augusta Resource, are mining companies that primarily rely on equity financing as the principal means of funding their business activities. Most junior mining companies specialize in exploring and developing mining properties. Like Augusta Resource, they employ professional staffs and highly qualified consultants to conduct activities that ultimately enable them to supply the minerals society requires to meet its present and future needs. Although many small mining operations are managed and operated by junior mining companies, others like Augusta Resource are working to develop their first mining operation. There is no reason why a junior mining company cannot grow into a mid-sized or major mining company. A local example is the recent acquisition of the long-established Pinto Valley copper mine by the Canadian junior, Capstone Mining Corporation, who will now step into the mid-size company category. One of the best examples of a junior mining company becoming a major company in the gold mining business is the Barrick Gold Corporation. Initially founded in 1980, Barrick Petroleum was an unsuccessful, privately owned oil and gas company. It became a public traded mining company in May 1983, when its name was changed to Barrick Resources Corporation. Over the next two decades of wise mergers, the purchase of established mining properties and efficient operations, this junior mining company became the world’s largest gold producer. Similar to what Barrick did with its many acquisitions in Canada, Nevada and overseas, Augusta Resource Corporation has acquired and developed a very promising property that will provide a firm foundation on which to build a profitable business. Individuals and institutions, who have invested in the Augusta Resource Corporation and committed to finance the Rosemont Copper project, have a very good understanding of the risks involved and the track records of the highly qualified professionals, who manage these companies. Their confidence in the economic viability of this 21st century mining project and its management is demonstrated by their willingness to participate in this business venture. The motives behind Ms. Hartmann’s statements made at the Save the Scenic Santa Ritas’ recent fundraiser were self-serving. However the fact remains, the Rosemont Copper project would have never reached the final stages in the permitting process had it not been for the professional expertise and conduct of the management and staff of Augusta Resource Corporation and its subsidiary, the Rosemont Copper Company. David F. Briggs is a resident of Pima county and a geologist, who has intermittently worked on the Rosemont Copper project since 2006. He can be contacted at geomineinfo@aol.com. Copyrighted by David F. Briggs. Reprint is permitted provided that credit of authorship is provided and linked back to the source. This article is a guest post by Rick Grinnell, VP, Southern Arizona Business Coalition, www.soazbc.com in response to a press release from opponents of the Rosemont Mine. In a recent press release by Save the Scenic Santa Ritas (“Augusta Resource Shareholders Meet, Future of Rosemont Mine Uncertain”) stating the future of Rosemont uncertain, it is apparent that this audience doesn’t understand the business of financing for major development projects or the mining industry’s history of financing. They don’t grasp or refuse to acknowledge standard financing practices of a development of this magnitude. Investors have different objectives and some are willing to take higher risks at the beginning of a project for a higher rate of return, while others may wait until certain bench marks and goals have been reached. This isn’t the first project for this type of investment and won’t be the last. This group’s endless attacks have proven to be filled with innuendo, misstatements and in some cases, what I perceive as intentions to slander the integrity of the project and the management team. This team has over 550 years of mining experience and are some of the best in this industry. On a personal note, we here in Southern Arizona are fortunate to have this industry and the quality of personnel as neighbors and citizens. This company will be a genuine partner for many years. The good people of Rosemont Copper are personally invested, serving on various charity boards and organizations. The opponents of Rosemont have lost every appeal. The facts cannot be discounted by emotional rhetoric and the dissemination of blatant misrepresentations of this mining project. The initial objections have been answered through an educational process about the Rosemont project. I can confidently state the greater majority of citizens of Southern Arizona are satisfied that Rosemont Copper will bring a desperately needed economic boost to our area and will do so in the most responsible and respectful way possible. This is the next generation of mining. Finally, I take issue with Mr. Ray Carroll’s (Pima County Supervisor, District 4) assertions that the investors are being misled and, in other public forums, that this project will devastate Southern Arizona. He continues to attack Rosemont’s integrity without factual substance or merit. His continued sarcastic, arrogant and disrespectful comments are not that of a Statesman, but rather a bully on the prowl to gain personal or political leverage in his quest to find significance in his position. Despite the continued efforts of the opposition to malign this project, the law, the facts and the integrity of the process will prevail. If we remove metals from the service of man, all methods of protecting and sustaining health and more carefully preserving the course of life are done away with. If there were no metals, men would pass a horrible and wretched existence in the midst of wild beasts… -Georgius Agricola, in De Re Metallica, 1556. For Arizona, it is not just metals. Arizona produces sand and gravel, limestone for cement production, coal for electrical generation, and a variety of industrial minerals which contribute almost $2 billion to Arizona’s economy (see here). According to the Arizona Mining Association, Arizona currently produces 68% of domestically mined copper. With that copper production comes by-product molybdenum, gold, silver, platinum, and rhenium. Incidentally, The Sierrita Mine south of Tucson is currently the onlydomestic producerof rhenium, a metal used in high-temperature, super-alloy turbine blades for jet aircraft and other land-based turbines. The Sierrita plant processes output from other mines on a toll basis. It may soon be joined by a second rhenium plant at the Kennecott (Rio Tinto) mine in Utah. The direct and indirect economic impact of copper mining on Arizona’s economy is about $4.6 billion annually. That includes $3.2 billion in personal income, $500 million in state and local government revenues, and 49,800 high-paying jobs for Arizonans. Average labor income of mining company employees (including benefits) is $108,000 per worker vs. $47,000 for all Arizona workers. If we add in non-metallic, non-fuel, minerals, then Arizona produced about $8 billion worth of mineral products in 2012 according to the U.S. Geological Survey. Arizona ranks second, after Nevada, in value of total mineral production. The U.S. total value of mineral production was about $76 billion which supported more than 1.2 million jobs in 2012. 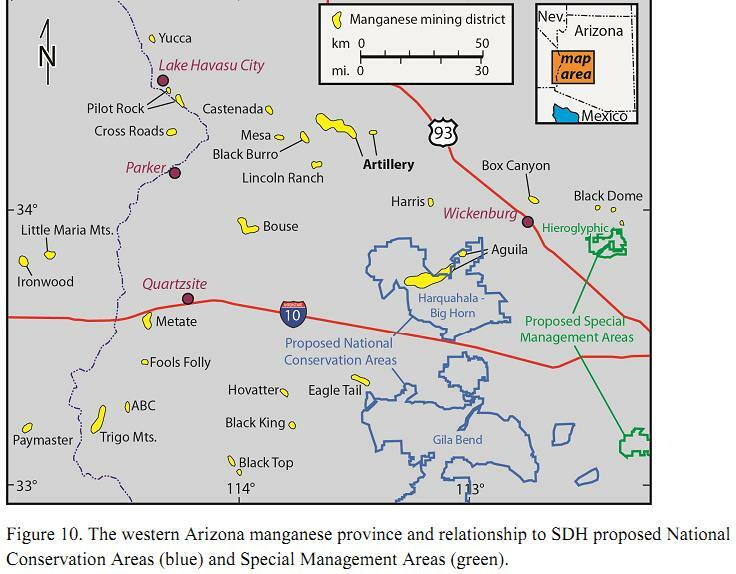 Arizona is endowed with great mineral resources as shown on the map below prepared by the Arizona Geological Survey. Currently ASARCO and Freeport-McMoRan Copper & Gold are the two biggest copper producers in the state. ASARCO operates three mines and a smelter. According to the Southern Arizona Business Coalition, in 2012 ASARCO paid wages and benefits of $215.8 million, property, severance, and sales taxes of $47.2 million, and employed 2,198 people in Arizona. Freeport operates mines in Safford, Morenci, Bagdad, Miami, and Sierrita. They paid wages and operational spending of $860 million in 2012, taxes of $274 million while employing 7,600 people directly and indirectly employing an additional 30,000 people. Perhaps the largest project is that of Resolution Copper near the town of Superior just west of the famed Globe-Miami mining district and just north of ASARCO’s Ray mine. This is a bold undertaking because the orebody is 7,000 feet below the surface. Resolution says that at peak production, this mine will be the largest copper mine in North America, producing over one billion pounds of copper per year. Resolution estimates that over the 64-year life of the mine, the project will generate $61.4 billion in economic value, provide $20 billion in tax revenues, and provide 3,700 permanent jobs. The Rosemont copper mine south of Tucson is nearing the end of its long journey through the regulatory maze, and mine construction may begin early next year. This mine will generate 2,900 Arizona jobs and inject $19 billion into Arizona’s economy and pay $404 million in local taxes over its 20-year projected life. The mine expects to produce 243 million pounds of copper per year. Curis Resources is developing an in-situ copper mine near Florence, Arizona. In this project, instead of mining rock, Curis Resources “seeks to dissolve copper minerals from an underground deposit by introducing water with a lowered-pH (making it slightly acidic).This low-PH, water-based solution dissolves the copper and allows it to be pumped to the surface through a continuous loop water treatment system.” This deposit, lying 400-to 1200 feet below the surface contains approximately 2.84 billion pounds of copper. Curis estimates that over the projected 28-year life of the project, it will generate $2.2 billion in economic activity for the state of Arizona, $1.1 billion in economic activity for Pinal County, $325 million in taxes and royalties for Arizona government, and $1.46 billion in increased personal income in Arizona, 170 direct jobs at the project site in Florence, and 681 jobs in the state of Arizona. TheI-10 copper deposit, located along Interstate 10 between Benson and Willcox, Arizona, is being investigated as another in-situ copper leaching project by Excelsior Mining Corporation, a Canadian junior company. They estimate the deposit currently contains an indicated oxide copper resource of 3.21 billion pounds and an additional inferred oxide copper resource of 0.88 billion pounds. Wildcat Silver Corporation is in the exploration stage of its Hermosa Project which is evaluating the silver-manganese potential in the historic Hardshell mining district near Patagonia in Southern Arizona. Their preliminary economic assessment estimates a measured and indicated resource of 236 million ounces of silver and an inferred silver resource of an additional 79 million ounces. Project life is estimated at 16 years. Wildcat estimates that annual production will be 4.1 million ounces of silver, 233,000 tons of manganese carbonate, 20,187 tons of zinc cathode, and 960 tons of copper. Copper Creek is an old mining district located on the east bank of the San Pedro River and on the western slope of the Galiuro Mountains about 75 miles northeast of Tucson. The property has been acquired by Redhawk Resources, a Canadian junior mining company that plans to develop an underground mine for copper, molybdenum, and silver. Redhawk estimates a resource of 7.75 billion pounds of copper, 150 million pounds of molybdenum, and 32 million ounces of silver. The Oracle Ridge mine is a small, underground copper mine in the Santa Catalina Mountains just north of Tucson. The mine was operated intermittently, most recently from 1991-1996. The mine is being developed by a junior Canadian mining company, Oracle Ridge Copper (project website). The company anticipates employing about 200 people to run the mine which has a projected life of 11 years. The mine will produce 140 tons of concentrate (about 30% copper) a day which will be trucked off the mountain and transported to a smelter. In northern Arizona, near the Grand Canyon are over 1,300 known or suspected breccia pipes many of which contain uranium oxide as well as sulfides of copper, zinc, silver, and other metals. 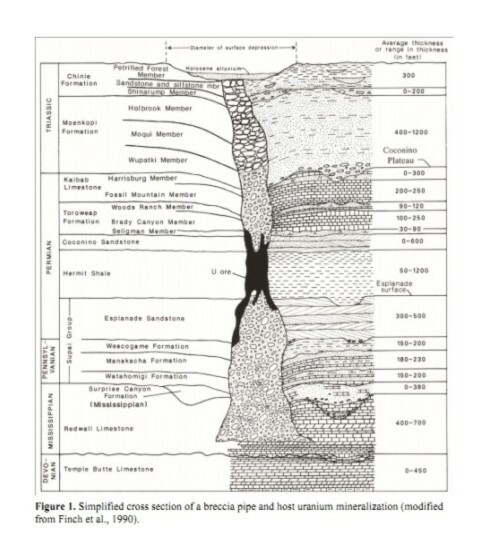 According to the Arizona Geological Survey, “Total breccia-pipe uranium production as of Dec. 31, 2010, has been more than 10,700 metric tons (23.5 million pounds) from nine underground mines, eight of which are north of Grand Canyon near Kanab Creek.” This area is mired in fears of contamination of the Colorado River (see Uranium mining and its potential impact on Colorado River water) and a 20-year, million-acre mineral entry withdrawal by the Department of the Interior. In northeastern Arizona there is potential for a major potash deposit. American West Potash has recently delineated, a considerable resource estimated at 158 million metric tons of sylvinite (a mixture of sodium and potassium chloride, not to be confused with sylvanite, a gold telluride), with about 16 million metric tonnes of K2O; and inferred resources of 560 million metric tonnes of sylvinite with just over 66 million metric tons of K2O in the Holbrook Basin, about 30 miles east of Holbrook, Arizona. The Holbrook Basin area also holds potential for helium and shale oil resources. 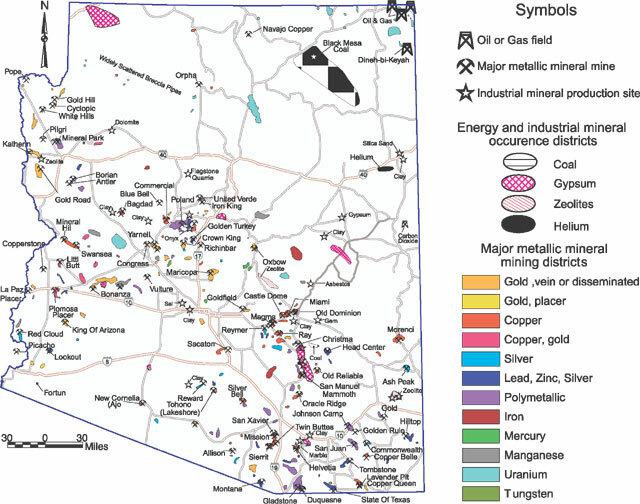 Arizona currently has three producing gold mines and several other prospects being actively explored for gold (see here). As you can see, besides currently producing mines, Arizona holds future potential that will add jobs and economic value to the local, state, and national economy – if they can get through the bureaucratic regulatory maze. Remember, the value of mining is not just the money, it is in providing the products we need to keep our civilization going. If it can’t be grown, it has to be mined. The AZGS assessment was limited to the following types of deposits: (1) sand and gravel (aggregates), which are used for concrete and asphalt, (2) porphyry copper deposits, which may yield large amounts of byproduct molybdenum, silver, and gold, (3) gold deposits in veins, some of which contain substantial silver, and (4) manganese deposits. 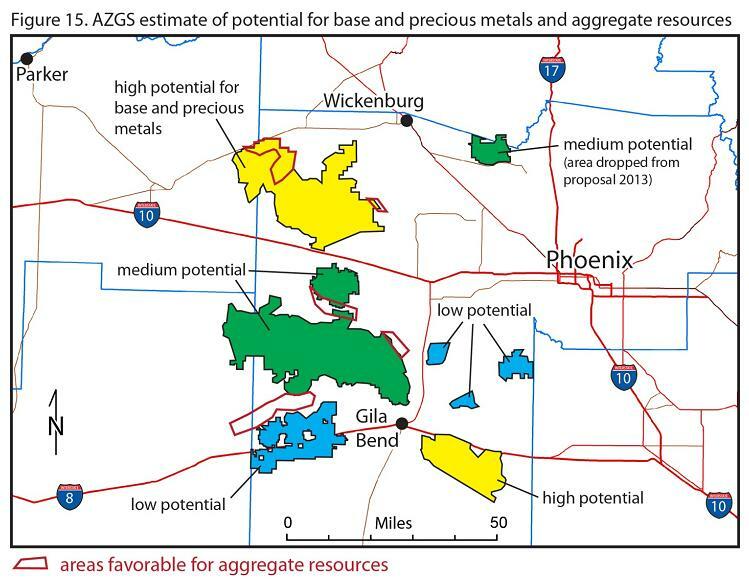 AZGS has identified five areas within and adjacent to the Heritage Area that are especially favorable as a supply for much needed aggregates. 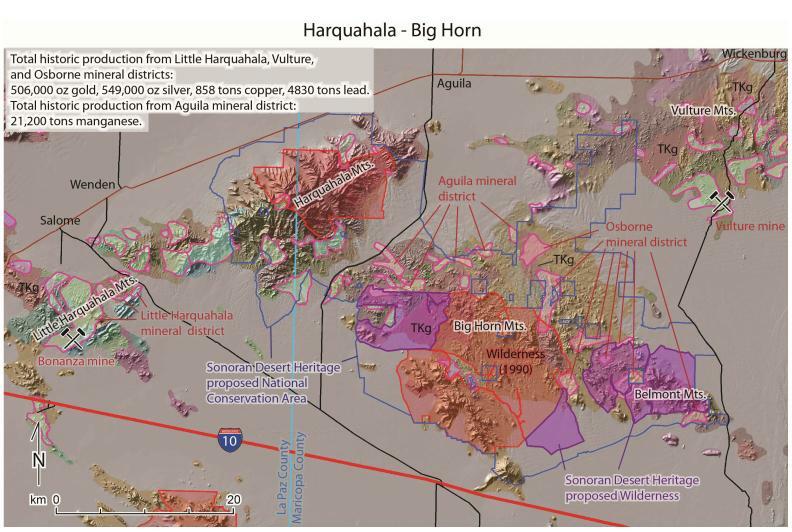 The Harquahala – Big Horn Mountains area, which is included in the Heritage plan, has geology favorable for gold vein deposits. The map below shows the northern part of the area. On the map, orange areas show existing wilderness areas, purple areas show Sonoran Desert Heritage proposed wilderness areas, and the light blue line shows the boundary of the proposed Sonoran Desert Heritage National Conservation Area. Small mines and prospects within the proposed conservation area have produced 506,000 ounces of gold and 549,000 ounces of silver. (the other two are in northern and central Chile). At the current copper price, Arizona total copper production from 1874-2010, would be worth $472 billion. The Big Horn Mountains contain rocks of the right type and age for large copper deposits. Historic mining in the Big Horn Mountains yielded millions of pounds of copper and lead as might be expected for mineralization peripheral to a porphyry copper deposit. The Gila Bend Mountains to the south are largely covered by younger volcanic rocks. The uncertainty in evaluating the possibility of porphyry copper deposits is high because of this cover, but there are enough indications of mineral deposits, including minor production from the Webb district (27,000 lbs. historic copper production) and scattered evidence of historic prospecting and small mines, that this area is considered to have moderate potential for porphyry copper deposits. Manganese is used in the production of steel. Currently, the U.S. imports 100% of its manganese. Numerous manganese deposits are scattered over a large region in western Arizona and extend into southeastern California. These deposits are low grade (generally only a few percent Mn) and formed during the past 25 million years. Most historic production occurred between 1953 and 1955 when the US Government purchased manganese at above-market prices. Total historic production is ~100,000 metric tons of manganese (226 million lbs.) from 24 mining districts. Mountains. The Black Dome district, with 344 thousand pounds of historic manganese production, is located north of the Hieroglyphic proposed Special Management Area. Manganese in these districts has not been in economic concentrations historically, but could become so if serious supply disruptions occur and/or prices increase sufficiently, see map below. The study should be considered an overview assessment. Note that the Arizona Geological Survey is serving as a scientific advisor and is not advocating any position, but I will. The Sonoran Desert Heritage Area proposal, if passed at all, should be reduced to exclude areas with medium to high mineral potential as a matter of economic and national security. If established there should be no additional “buffer areas” adjacent to the heritage area. Posted in Geology and tagged Copper, gold, heritage areas, manganese, mineral potential, silver, Sonoran Desert on May 13, 2013 by wryheat2.